Strong women don't have attitudes. We have standards. I am a strong women and i am proud of it. You have to be strong as really in this big wide world there is really no one who will be there for you, only you will be there for yourself so you have to be strong. I have learnt this recently. Nothing wrong with that. It makes a great woman. We don’t have to play the role of being labelled. Standards are good , why should we let someone’s opinion matter ? We women have to stand strong , so no one can’t walk on us. People can say or feel what they want. I don't put up with nobody's bullcrap. I have worked too long and hard to allow nonsense in my life. Strong women have standards picture/image is an Inspirational Stuff to Inspire and Motivate You. You can download pics by just clicking on the Images. Thanks for visiting Truth Follower an online place for huge collection of inspiring pictures, quotation, and Sayings Images. 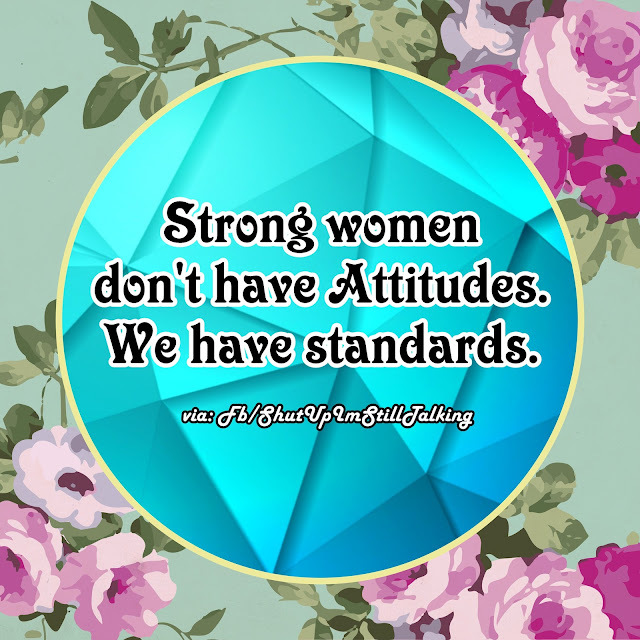 If you like Strong women have standards, Please Share with friends and family on Facebook, Twitter, and Pinterest.